Trevor Horn is joining Yes’ 50th anniversary celebration shows at the London Palladium this weekend. He’s also sung the vocals and added some tweaks on a new version of the Fly From Here album (Fly From Here - Return Trip). FIFTY years of Yes! You’ve loved the band since before you ever joined, haven’t you? Talking of journeys, 2011’s Fly From Here, which you produced and co-wrote, is enjoying another take-off, with you now singing instead of Benoit David. What motivated this? Did Fly From Here always feel like a fluid work-in-progress to you? Was Benoit offended at all by being erased? Is it true you’ve been going to the gym and taking singing lessons in preparation? Do you listen to Yes now as a producer or as a singer? Are people who best know you for your Eighties reinvention of pop surprised at your abiding passion for Yes? The existence of two sort-of-Yes bands (with the Anderson-Rabin-Wakeman outfit also touring) is weird, isn’t it? 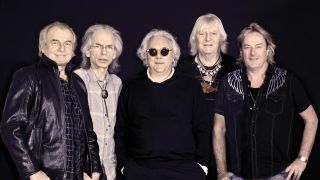 Yes play the London Palladium 24th and 25th March. There’s a fan convention at the venue on the Sunday. Fly From Here – Return Trip can be exclusively pre-ordered via Pledge Music here.